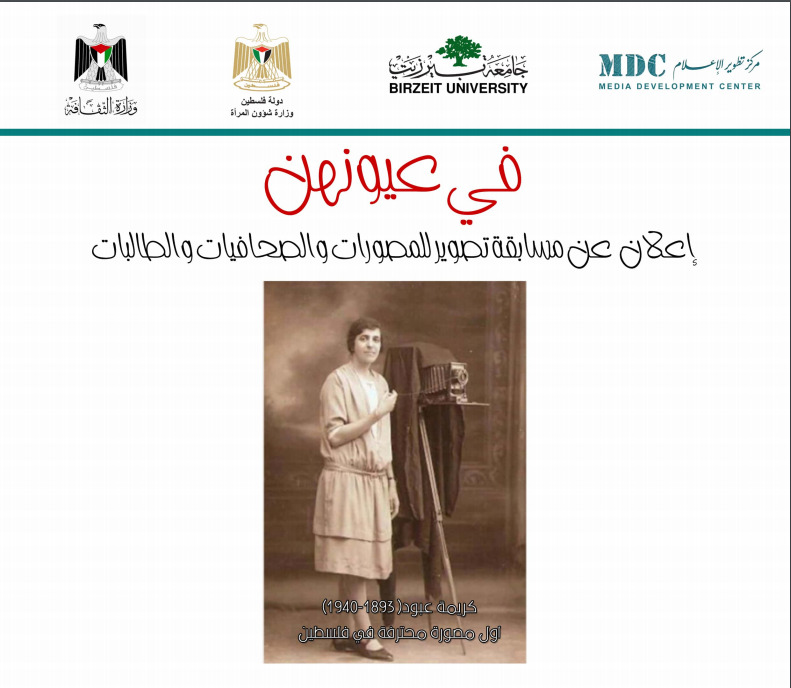 The Media Development Center (MDC) at Birzeit University, the Ministry of Women’s Affairs, and the Ministry of Culture announce the launch of the competition “Through their Eyes” under the title ‘Women and Professions’ for female photographers, employed or unemployed journalists, and media students. The competition aims to collect a large number of images of women and their professions in Palestine and to encourage creativity in photojournalism by female Palestinian journalists. Together, we intend to construct a beautiful and up-to-date archive that reflects the reality of Palestinian women and their presence in the judiciary, politics, culture, business, the press, and other professions. Access to the pictures in the archive will be made available to all media institutions. Sixty photographs from the cameras of female Palestinian journalists will be selected based on criteria defined by a special jury, and the winning photographs will be presented in an exhibition held on the 8th of March to mark International Women’s Day at Birzeit University. The exhibition will then tour several Palestinian universities, Nazareth, and the southern West Bank. Six prizes will be awarded for the best photographs. The jury consists of male and female experts in the media, photography, and gender. Must be a female Palestinian journalist residing in the West Bank, the Gaza Strip or 1948 territories. Must be a journalist or a graduate in journalism from a Palestinian university or college who is working or seeking a job in journalism. Must submit three recent high-quality photographs (2017) that have not been published previously, either in black and white or color, and not less than 3M JPG. The jury will select the best one of the three photos on behalf of each participant. The photograph must have been taken with a camera and printed without editing or using any photo processing software. In the event of doubt, the jury has the right to ask for the original photograph. The theme of the photograph must be professional Palestinian women and should take aesthetic and informative elements into consideration. The photograph presented must not have been published or displayed previously in an exhibition or have been awarded a prize. The deadline for receipt of photographs via email: FromWomensEyes2017@gmail.com is Monday 10 April, 2017. Please provide information about the photograph and the profession it reflects, the location and date, why this photograph and profession were chosen, plus personal information including a CV, permanent address, personal photo, and information about your work, university, and field of study. Written permission to publish the photograph must be obtained from the women featured in the photographs. Note: Any applications that do not meet the required conditions will be excluded from the competition.